Drink in the box has a nephew at: Snack in the Box. The snack box is again made from indestructible Tritan plastic and consists of two separate compartments. 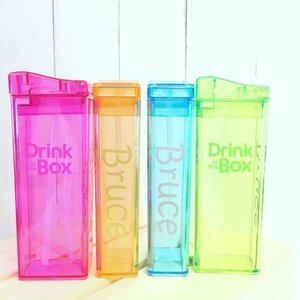 Snack in the Box, by the creators of Drink In The Box is a transparent snack box with two separate compartments. Each section can be opened separately from one another. Fill it with two different or the same snacks and take them to school, while traveling or at work.?? The snack box is leak-proof and durable; you fill him endlessly with a tasty snack. The two parts are sealed with a so-called pop-up lid, which makes it easy to dose. ?? Snack in the Box fits perfectly into lunch boxes and is made from Tritan ??? and polypropylene: it is BPA and phthalate free. Snack in the Box is suitable for the dishwasher. Place this at the top of the machine, near the glass. The bottom of the dishwasher is to hot for the Tritan plastic.?? - Available in four major colors: green, orange, blue and pink. Tritan is made in America and is an extremely durable, safe and beautiful material, the best available for making qualitative drinking bottles. Deliberately chosen for all materials of Drink in the Box. It is brought about by a curing process after melting, wherein the temperature must be exactly right to the high quality (not break) to guarantee. Like biodegradable plastic to recycle / reuse Tritan for other products. 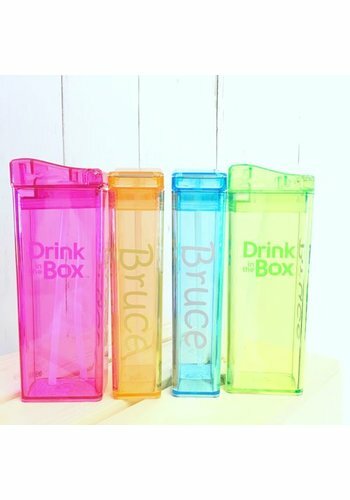 Drink in the Box wanted to make a product that is not only safe, functional, beautiful and loved by children but also goes a long way. For all products Drink at The Box are decals available. These stickers are made of vinyl and dishwasher safe. What font and color sticker would you choose? Check here the possibilities.